Although much still needs to be learned about supplements that contain “friendly” bacteria, their potential benefits for ill or stressed horses are widely accepted. You’re preparing your horse for a 200-mile trailer ride to your new home. You know the trip will be stressful, but you plan to wrap his legs carefully, make sure he’s up to date on his shots and even give him a preventive dose of antiulcer medication. Is there anything else you can do to safeguard his health during the trip? The cut on your mare’s chest was deep and dirty, but your veterinarian arrived quickly. The wound is now stitched closed and your mare is on a course of antibiotics to combat infection. During the weeks of nursing care to come, can anything else be done to support her overall health as her body mends? Your schedule couldn’t be any busier this fall. Each week, it seems, you’ll be at a different show, clinic or event. Your horse’s new routine will be no routine at all. What can be done to help prevent his hectic, constantly shifting schedule from dragging him down? In each of these scenarios, one relatively new option may be helpful in safeguarding the horse’s health: probiotics, dietary supplements that contain beneficial live microorganisms, usually bacteria, but also sometimes yeast and other fungi. Billions of bacteria, protozoa and fungi, often referred to as the intestinal flora or microflora, live in the horse’s gut. These organisms break down foodstuffs to make nutrients available, prevent growth of harmful bacteria and produce vitamins and amino acids. Probiotics are administered "to manipulate the normal intestinal flora in such a way that is beneficial to the health of the horse," says equine nutritionist Kelcey Swyers. 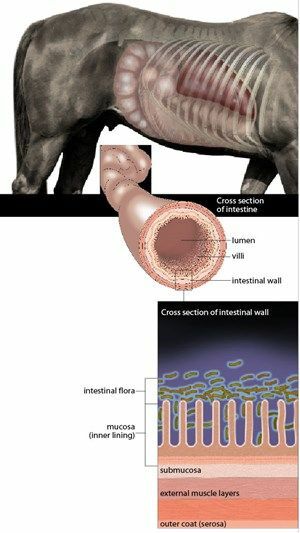 Probiotic bacteria colonize the mucous layer of the equine intestines. The inside of a horse’s gut is home to colonies of bacteria, protozoa and fungi, often referred to en masse as the intestinal flora or microflora. “It has been estimated that there are approximately five billion organisms per gram of digestive fluid in the mammalian digestive tract,” Swyers says. 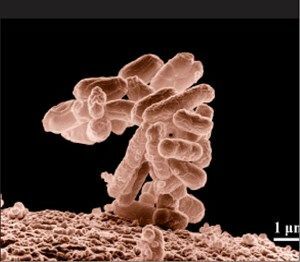 These tiny organisms are engaged in the usual activities of life: consuming one set of substances, excreting another and reproducing. Together they create a complex, symbiotic web. The excretions, called metabolites, produced by one organism may feed another, which in turn produces a third that may be a nutrient necessary to the horse’s life. For example, the complex molecules in starches and cellulose cannot be directly absorbed by the horse’s intestine—they must first be broken down by the flora into components that he can use. Credit: Eric Erbe/USDA In addition to producing many of the vitamins, amino acids and other nutrients the horse needs, the intestinal flora help keep potentially damaging bacteria, such as Salmonella and Escherichia coli, under control. In addition to producing many of the vitamins, amino acids and other nutrients the horse needs, the intestinal flora help keep potentially damaging bacteria, such as Salmonella and Escherichia coli, under control. They do this in several ways, including colonizing the gut wall---by attaching themselves to the epithelium0, they block spaces that might otherwise be occupied by invaders. Some of the bacteria also produce lactic acid, which maintains the local environment within a narrow zone of acidity that is comfortable for the beneficial bacteria but hostile to the pathogenic ones. Intestinal microflora function in a delicate but constantly fluctuating balance. For example, if a horse who usually eats mostly hay gets more pasture grass one day, the organisms who thrive on that particular mix of foodstuffs thrive while their counterparts decline. Most of the time, these fluxes are harmless and self-correcting. At other times, however, the balance can be tipped in a direction that can cause harm to the host. The classic example is the horse who breaks into the feed room and gorges on grain: Suddenly, there is too much starch to be digested in the stomach and small intestine, and it passes into the hindgut. There it fuels accelerated population growth among certain microbes, which results in greater volumes of lactic acid and a lower pH, killing off other good bacteria in the vicinity. This can begin the cascade of events that leads to devastating digestive-related illnesses, including laminitis. But there are many other factors that can alter the microbe levels in the gut. “Anything that changes the pH, interferes with gut motility or affects the fluid levels---all would change the balance,” says Kathleen Crandell, PhD, a nutritionist with Kentucky Equine Research. In addition to sudden changes in diet, specific events that can upset the microflora levels include the administration of oral antibiotics, dehydration, fever and ingesting feed tainted with molds or bacteria. Even stresses, such as those associated with travel and competition, can have an effect. Going on the road tends to disrupt the horse’s routine: He may not drink as much, he may be getting different hay or grasses, his anxiety may keep him off his feed entirely for atime. Also, stress produces measurable changes in levels of hormones, body temperature, immune responses, heart rate and other functions, all of which may cause the populations of beneficial bacteria to drop. These fluctuations, too, would likely self-correct in time, but meanwhile the horse might be somewhat “off,” perhaps enough to affect his performance, to inhibit weight gain, or to contribute to digestive upsets. “[Another] goal of giving probiotics to a horse is to add organisms—seed organisms—to form new colonies and rebalance the beneficial bacteria,” says Crandell. The thinking is that by helping to restore the populations of beneficial bacteria sooner, the probiotic supplement will offset any potential negative consequences of the disruption to the microflora. Credit: Miloslav Kaleb/www.visualsunlimited.com Probiotics contain living organisms. The bacteria may be in a dried, dormant state, but they can still die if mishandled. Heat is the biggest threat: "Don’t let them sit on the dashboard of your truck on a 100 degree day," says Kathleen Crandell, PhD, a nutritionist with Kentucky Equine Research. Even some tackrooms might get too hot—if you can, keep your probiotic refrigerated. Light can also be damaging. Keep the product in its original (opaque) container out of direct sunlight and even away from bright indoor lights. Finally, don’t forget the expiration date: Make sure you purchase the product well ahead of the "use by" recommendation. Does your horse need probiotics? To give young digestive systems ahead start. Foals acquire their intestinal flora from their environment—that’s one reason why they sometimes eat manure. A probiotic may help populate the young digestive system more quickly. To aid recovery from illness or infection in horses who have received oral antibiotics. Medications that kill harmful bacteria sometimes do collateral damage to beneficial organisms. After the course of antibiotics is finished, a probiotic may aid in faster recovery. To compensate for the effects of stress. Dietary changes, travel and/or competition can put stress on a horse’s system. To give the probiotics time to colonize, it is best to start administration two to three days ahead of the stressful event and continue until it is over. To reduce digestive upset in horses susceptible to chronic diarrhea and/or mild colics. 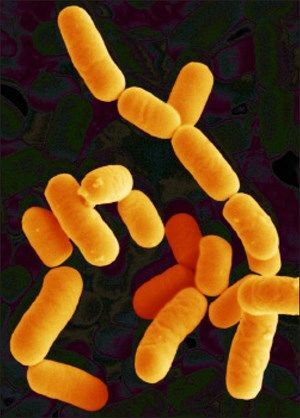 Probiotics may stabilize the microflora and promote a healthier environment in the gut. They may also be a good preventive measure in horses who have experienced serious colics. To help old or unthrifty horses better utilize nutrients. A probiotic may improve the efficiency of digestion and aid nutrient absorption in aged horses and others who have trouble maintaining weight. Consult with your veterinarian about giving your horse probiotics, just as you would when making any other dietary change. If your horse is not holding weight or has frequent mild colics or diarrhea, a probiotic may well be part of the solution, but you’ll also want to address any underlying medical issues. A wide variety of probiotic products for horses are now available. Some are pure cultures with only one or two bacterial species; others contain up to eight or more; many are mixed with other substances, including vitamins, yeasts, electrolytes, enzymes and prebiotics. 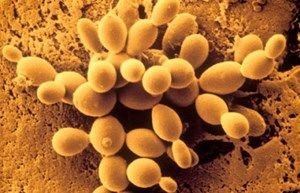 Yeasts (Saccharomyces cerevisiae, Aspergillus spp.) offer well-established dietary benefits, including improved performance during exercise and the production of better quality milk in mares; yeasts are often included in regular horse feeds. Prebiotics are nutrients that aren’t necessarily absorbed or utilized by the horse but instead “feed” the beneficial bacteria. You’ll often find these identified on the label as some sort of oligosaccharide, but bacteria themselves can also have a prebiotic effect if they produce by products that in turn nourish other bacteria. Your veterinarian or equine nutritionist may well have experience with specific formulations and can advise you about which ones might best suit your situation. For example, Crandell recommends that foals be given a product that also contains dried egg yolk antibodies and, in general, she believes that products with a wide variety of bacteria or a combination of probiotics and yeast are more likely to be effective. Once you’ve got that input, it’s a matter of choosing a product and keeping close watch on your horse to see how he does. The next few years ought to bring more answers about the best uses of probiotics in horses. In the meantime, if a probiotic is helping to keep your horse happier and healthier, there’s no reason not to keep offering it.